Recently, ButterflyCircle veteran Bob Cheong and I organised a talk and sharing session for some of our FaceBook newbies who have been contributing actively to the group. 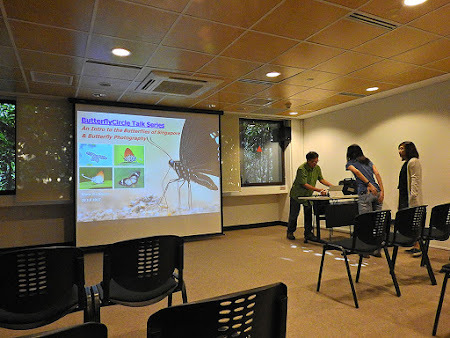 The talk was kept to a small group so that it would be more effective for those who were already interested in butterfly photography and who were enthusiastic and posting their butterfly photos regularly on the FB Group. 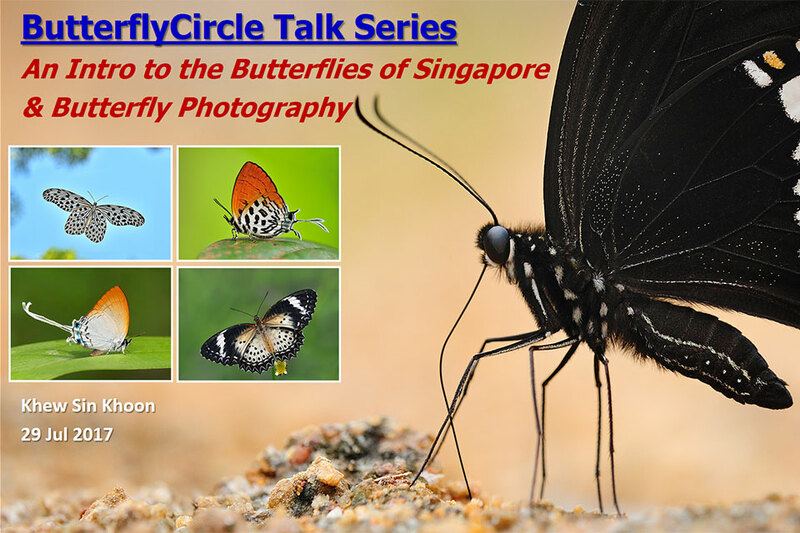 The talk would be focused on some fundamental principles and tips for the members to improve their butterfly photography in terms of exposure, composition, understanding butterfly behaviour and so on. 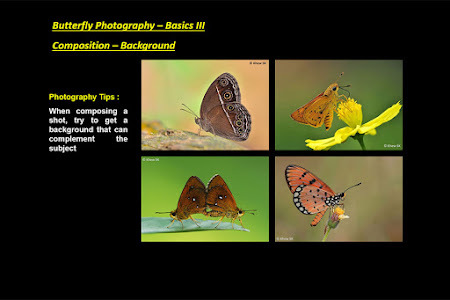 This sharing session was intended to help them even the odds when out in the field stalking and photographing butterflies and also to raise the quality of their butterfly photos. 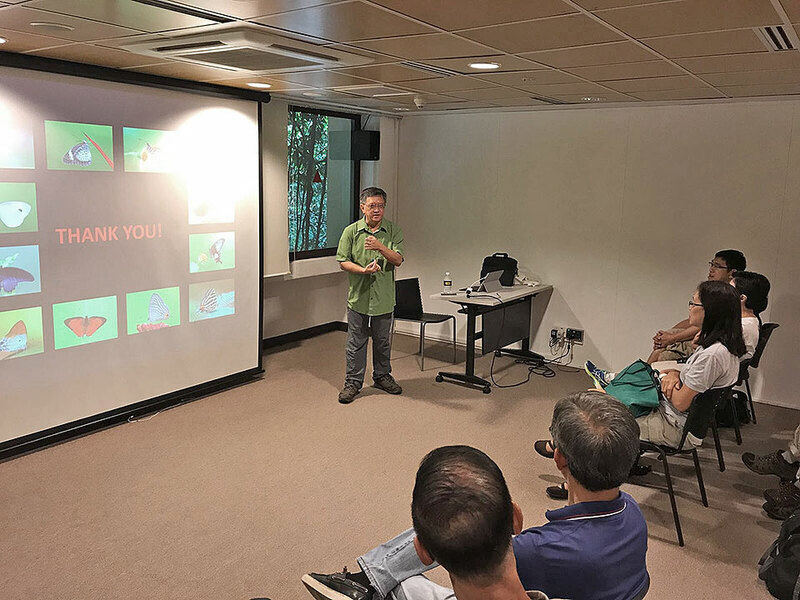 A small group of enthusiasts and supporters of the Butterflies of Singapore FB Group were specially invited for the talk, which was held at the Function Room of the Botany Centre, Singapore Botanic Gardens. The cosy room was ideal for the sharing session, and the small number of attendees who already shared a passion for butterflies and butterfly photography meant that as many questions could be answered as possible in two-hour morning talk. 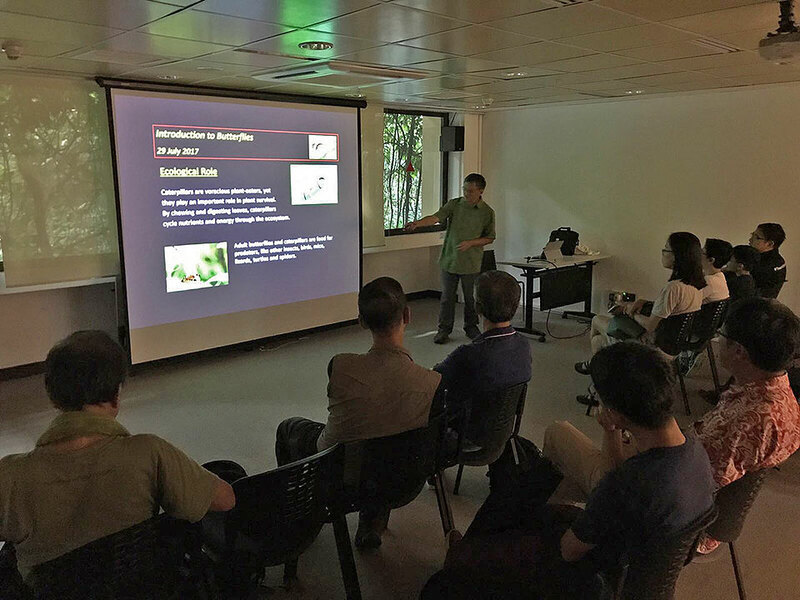 The talk started with a general introduction of butterflies in Singapore, their biology, behaviour and where to find them in various habitats - both in the urban and forested areas. Some information on butterfly defensive strategies like mimicry, decoy and camouflage of the various species found in Singapore were also discussed. Basic information on photographic equipment was also shared, as well as various camera settings, preferred lenses for butterfly photography. Fundamental information on the understanding of depth of field, magnification ratio of lenses and working distance were presented in as simple a format as possible so as to make these basic photographic concepts understandable. 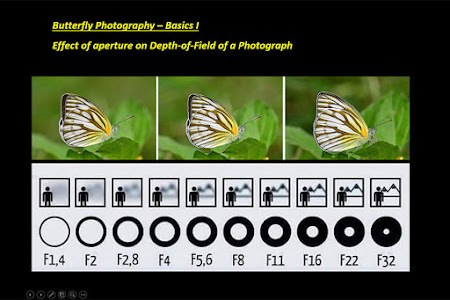 For example the reason behind the use of aperture priority mode for most butterfly photography situations were explained, and how the use of the aperture controls the depth of field for a clean smooth background. 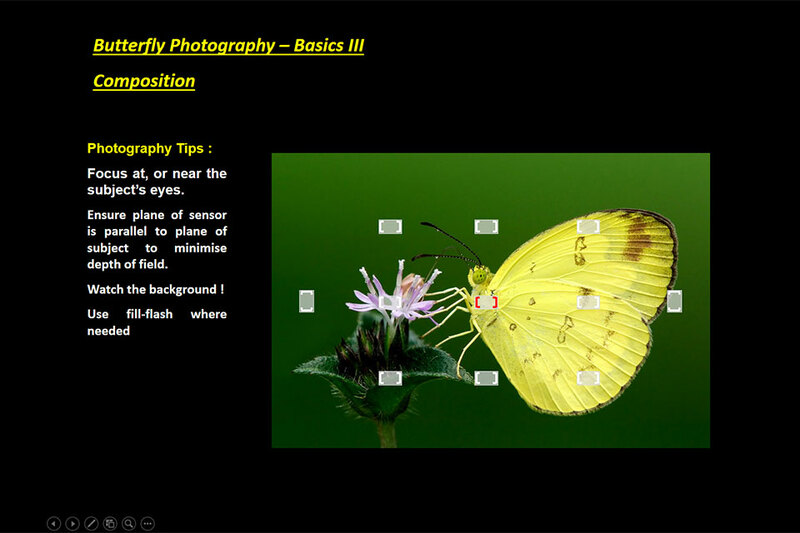 Bob explained the use of shutter priority or manual mode in situations where 'flappers' or fast moving butterflies require an appropriate shutter speed to 'freeze' the rapid flapping of the wings. 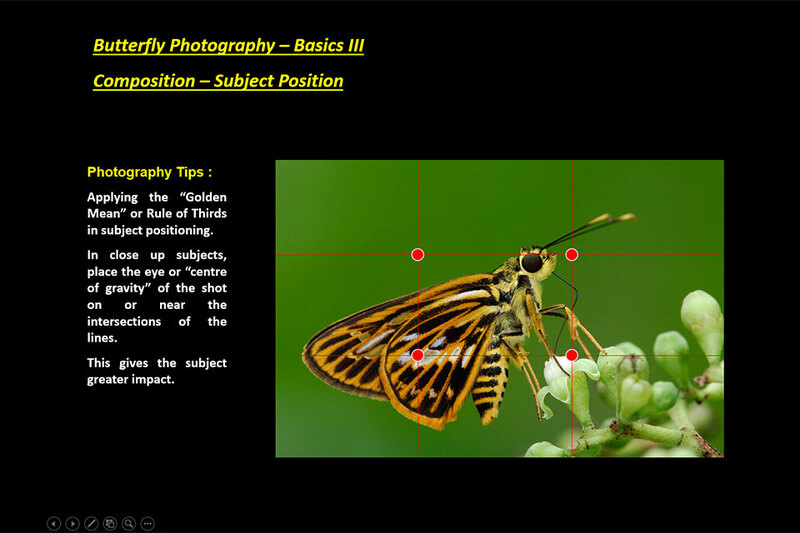 Relevant examples were used to illustrate some very basic rules like making sure that the butterfly's eye(s) are in sharp focus when photographing them. Composition techniques that would help to improve the overall presentation of a shot were also explained - in particular using the "rule of thirds" and "leading space" when composing or post-processing as shot to feature a butterfly in its best pose. 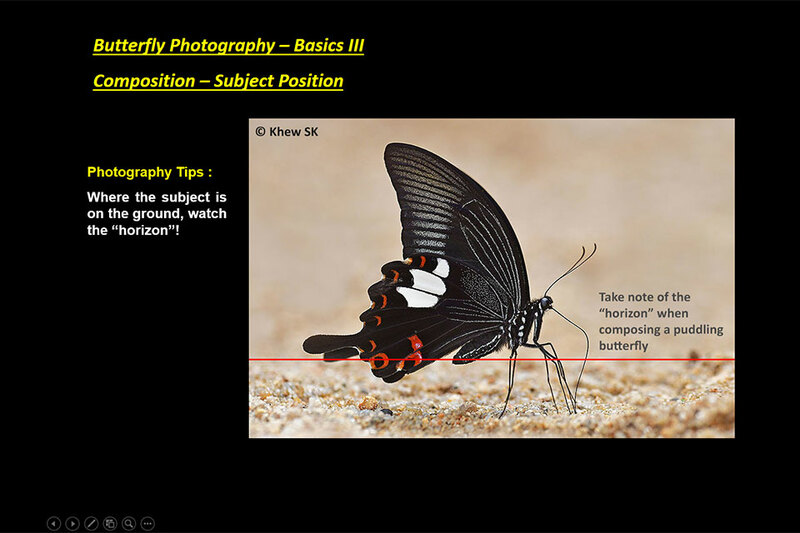 The importance of keeping the horizon level when shooting and posting puddling butterflies was discussed. Where the situations allow or opportunities present themselves, a butterfly photographer should also look for angles which could present the subject better with an uncluttered background, so that the butterfly becomes the main focus of the shot. 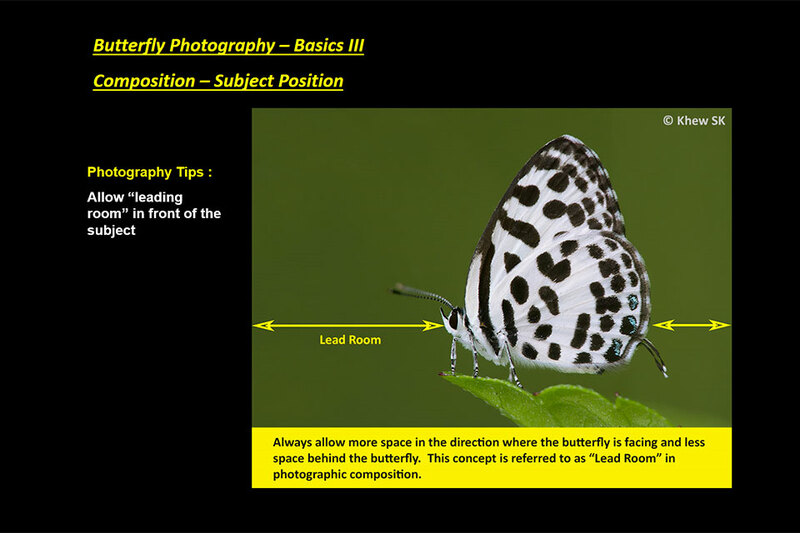 The session ended with some examples of fill-flash and why using flash can enhance a butterfly shot - even in bright sunlight. 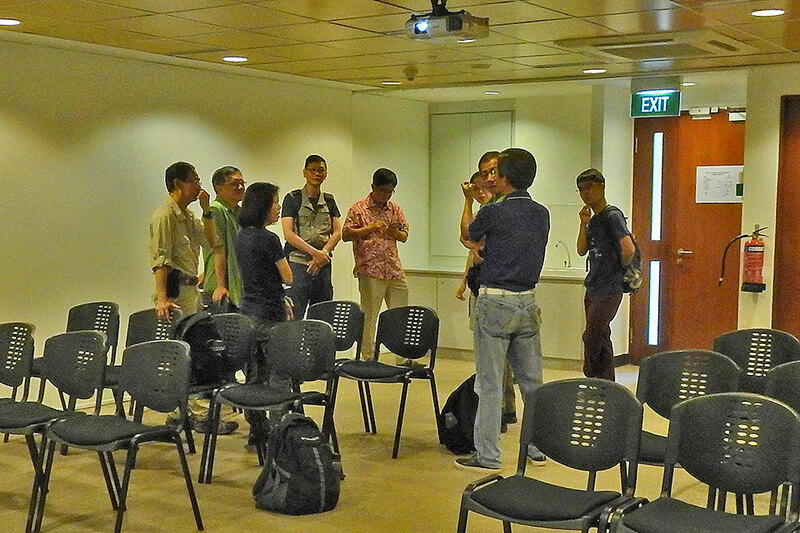 Examples of such situations where a flash can be used to bring the subject out of shadow or even out the harsh shadows were presented to explain the benefits of using fill-flash. 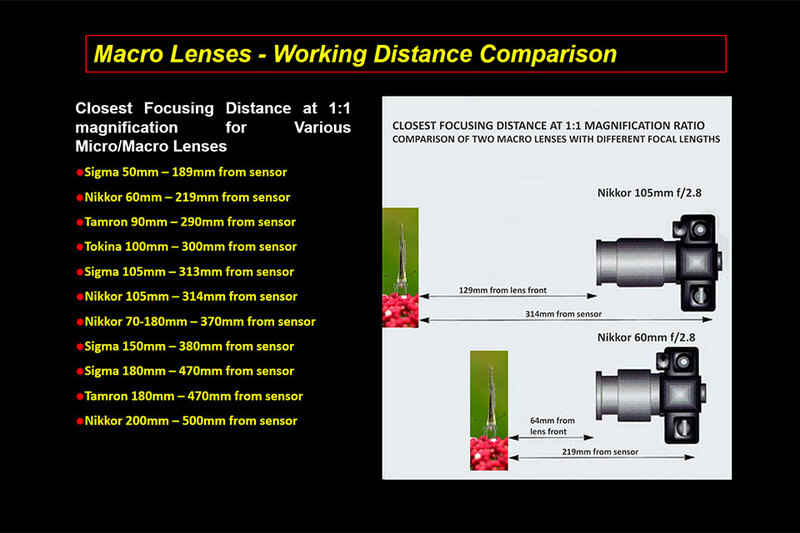 The attendees asked some questions on equipment and Bob and I were on hand to share our experience on the Canon and Nikon DSLR systems and various macro lenses. 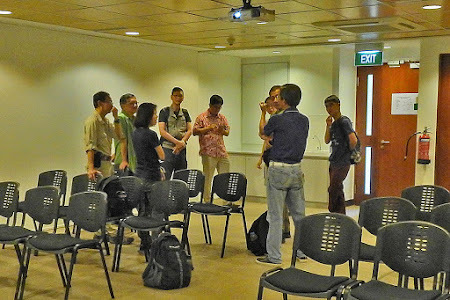 It was an interesting session and also to meet some of our FB Group's regular contributors and put faces to the names that we have only 'met' on social media, and also for the members themselves to meet each other. If there is interest for such talks in future, perhaps a more advanced talk on butterfly identification and other aspects of photography can be arranged. 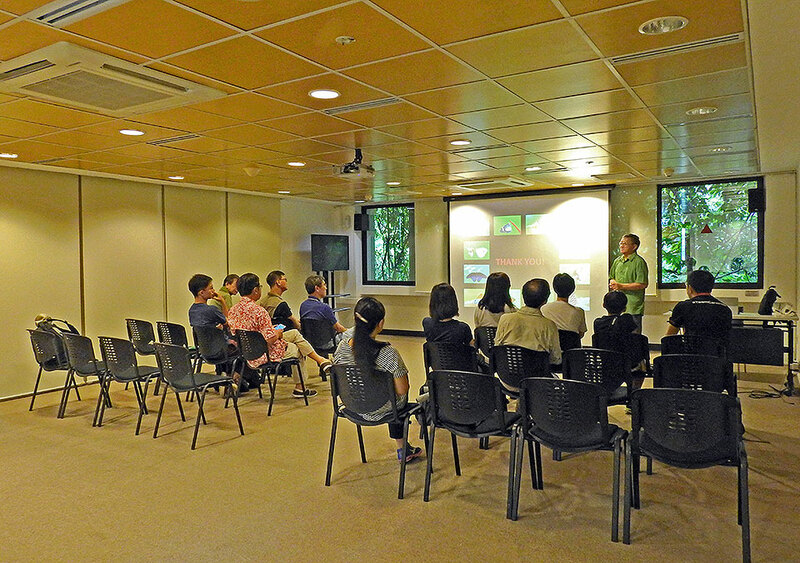 Special talks on butterfly gardening and breeding can also be held for those who are interested in such subjects. 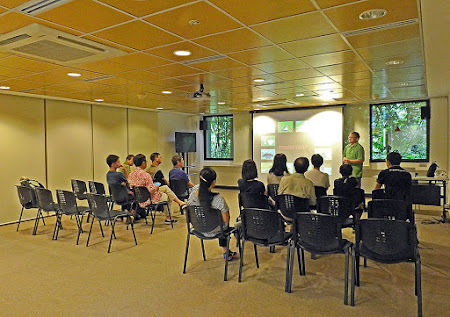 Mr Foo JL and his butterfly community gardening groups can be invited to share their experience and knowledge in these areas in future talks. 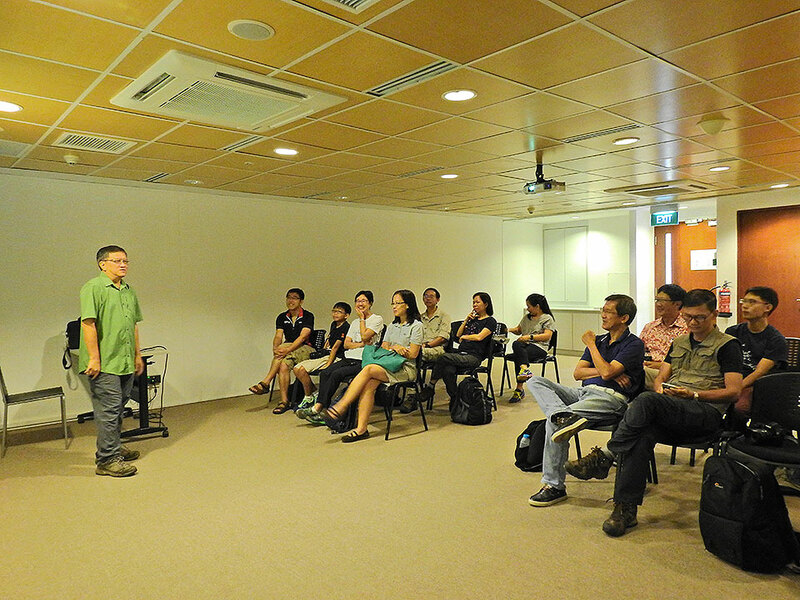 Special thanks to NParks and SBG for the use of the Function Room at Botany Centre and to their support staff, Kin Shimin and Cally Goh for being on hand on a Saturday morning to assist in the setting up of the room and technical support.